Story Mapping is a simple technique to visually depict a customer experience step by step from beginning to end. originating from Agile software development, this easy to adopt approach can be used too map product evolution , customer experience journeys, as well as more detailed product feature interactions. Story mapping is a team activity that fosters motivational and innovational thinking for problem solving. 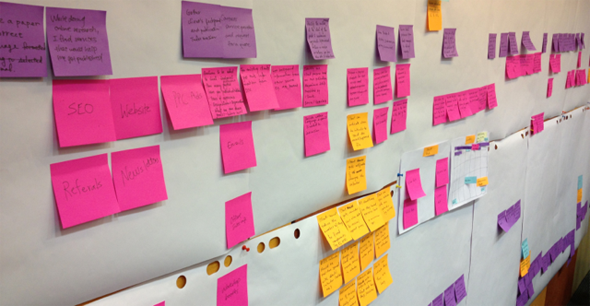 In its most rudimentary form, story mapping is achieved by writing customer goals and their related activities onto sticky notes and arranging them on a wall, table top, or even the floor – the idea being is that each sticky note can be quickly repositioned, restated, or removed completely from the story sequence as new thoughts and ideas from the team are surfaced. Implementing story mapping as part of product development is also a key step in attaining business agility as its team-centric and collaborative nature yield results much faster that other design and planning methods. Find out how to get a jump start on story mapping by contacting us today.